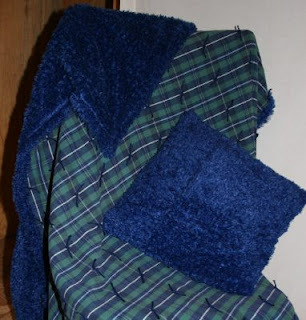 A tied quilt made from a single piece of flannel and a single piece of fleece is the perfect project for kids. Even little ones can make a quilt with this simple method. Whip up a few warm and snuggly quilts to give as Christmas gifts or to enjoy at home during the cold winter months. I made one of these quilts with a matching pillow for my son a couple of years ago. I also published How to Make a Simple, Luxurious Quilt with step-by-step instructions and a few detailed pictures. I used furry fleece and a flannel sheet – isn’t it beautiful? And no batting needed! What could be easier than that? Be sure to buy an even plaid so that you have a nice grid for your ties - or recycle an old plaid flannel sheet like I did. So gather your materials and a kid or two, and get started, ok?